I struggled a bit in deciding who to support for mayor. Independents Shauna Sylvester and Kennedy Stewart both seem like strong candidates. Stewart has a more detailed housing platform, while Sylvester is more detailed on the environment. Stewart is the more strategic choice, Sylvester the more female choice (seriously, Vancouver, 132 years and not one woman in the mayor’s chair?). In the end, premised on the assumption that Stewart will probably win regardless of all my soul-searching, I’m going with Sylvester. I figure if she gets enough support — perhaps even leapfrogging into second place past the NPA’s Ken Sim (dare to dream, right?) — the eventual winner might get the message that voters have some appetite for the nitty-gritty. Stewart’s penchant for headline-grabbing issues like the Trans Mountain Pipeline and the UBC subway are well and good, but they are no substitute for tangling oneself in the weeds of green buildings, zero waste, renewable energy, and bike lanes. Enterprising readers will notice that while I am endorsing all Vision Vancouver candidates for Parks and Schools, I am not supporting any of its Council candidates. I have always agreed with Vision on many issues, but this last decade, they really screwed the pooch on housing. True, there is only so much that municipal governments can do. One gets the impression, however, that housing affordability did not appear on Vision’s radar until the end of Mayor Gregor Robertson’s second term, by which time it was too little too late. Vision is long overdue for a well-deserved spanking, and progressive voters would do well to look to parties that set more ambitious non-market housing goals. You might also notice that I am not voting for any Green School Board candidates. I find myself philosophically aligned with Green Parties in general, but the Vancouver Greens are going through something of an identity crisis, valuing what they perceive as independence over what I perceive as principle. This sometimes manifests itself as fickleness or head-scratching unpredictability. A case in point: trustee Janet Fraser’s decision four years ago to vote in an NPA School Board chair instead of Vision’s Patti Bacchus. (To her credit, she switched back to Vision one year later, and has since become chair in her own right.) Or take the party’s short-lived nomination of engine-revving bike lane opponent Nicholas Chernen to its School Board slate. (He stepped down after reports that one of his many nuisance lawsuits against elected officials was still ongoing.) The Greens may reap political rewards for being everything to everyone — indeed, I would not be surprised to see them win most or all of the seats for which they are running — but their judgment can be questionable. That said, they have plenty of good ideas on sustainability and housing affordability, as well as several smart candidates. 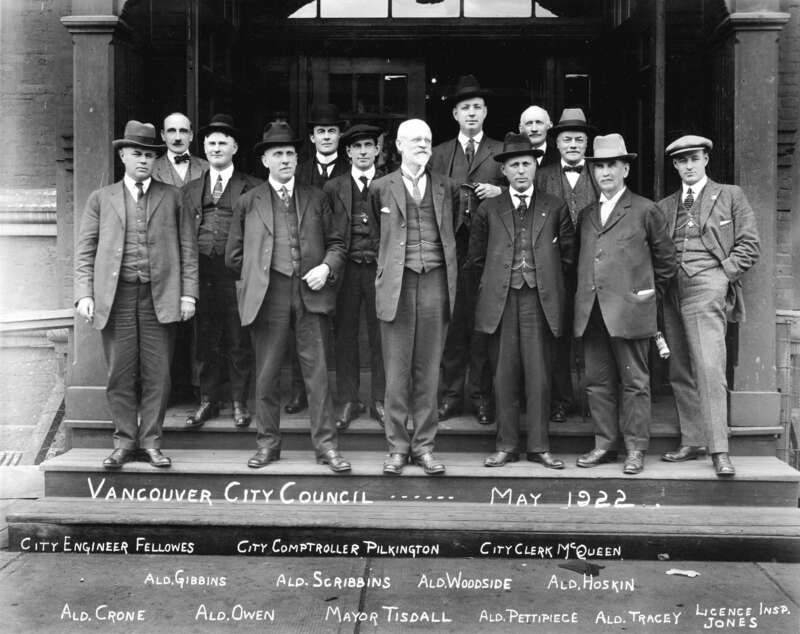 COPE, Vancouver’s oldest left-wing party, has long been so riddled by infighting as to be easily dismissed. However, with the addition of legendary anti-poverty activist Jean Swanson to its Council slate, the party seems on the verge of a mini-comeback. One poll last month showed COPE second only to the Greens in Vancouverites’ party preferences. Signature policies include a rent freeze and a mansion tax. Finally, there’s OneCity: not as centrist as Vision, not as nutso as COPE. Just smart, earnest progressives who skew young and female. Signature policy: a land value capture tax. Might be the best party in the bunch. First of all, let me start by congratulating you on your school board election victory this past Saturday. I voted for you enthusiastically, as I did your running mate Mischa Oak and the rest of the Green Party team on the city council and park board slates. It is truly gratifying to see a Greenie set to hold the balance of power on one of Vancouver’s three elected municipal bodies. Which brings me to my main reason for writing today. School board is scheduled to select a chairperson on December 8. I don’t know what direction you happen to be leaning at the moment, but I would like to respectfully urge you — barring any unforeseen eventualities — to vote to reappoint Vision Vancouver’s Patti Bacchus. Vision does not by any means deserve unconditional support, and I fully expect you will assess each issue before the board on a case-by-case basis according to its merits. I also happen to agree with the Green Party position that elected bodies in general function better when no single party is in control. But compared to Vision’s often poor performance on council and parks, on school board the party has for the most part done a commendable job. Under Bacchus’s leadership, the board has lobbied relentlessly for increased provincial funding, made public schools more welcoming to LGBT students, and stood up against Chevron’s sinister efforts to buy influence. None of this is to suggest that there is no room for improvement. There always is. But I for one — again, barring exceptional circumstances — have no desire to see the school board take a giant leap backwards under an NPA chair. Please consider using your new status as swing vote to build upon, and add a tinge of green to, Vision’s many accomplishments on education. Thanks for taking the time to read over my thoughts, and congratulations once again on your victory. Some Thoughts on the Vancouver Election … Plus Endorsements! With a week and a half to go before voting day in municipalities across British Columbia, the campaign here in Vancouver seems to have devolved into a veritable hatefest against two-term mayor and eccentric juice magnate Gregor Robertson. There is nothing surprising about that. Incumbents (a.k.a. the sinister hands currently at the controls of Big Government) typically draw vitriol like no others during election season. Yet for all the negative attention received by the mayor and his Vision Vancouver party at all-candidates meetings and in the opinion pages, for all the foaming at the mouth over towers and bike lanes and the dearth of transparency at city hall, polls show the man not-so-affectionately dubbed “Mayor Moonbeam” set to sail comfortably into a third straight term in office. His party too is predicted to win a (slightly reduced) majority on council, as it portrays itself as the only realistic alternative to the big bad Non-Partisan Association (NPA), Vancouver’s traditionally dominant party of centre-right overlords. Indeed, Vision seems well on its way to becoming Vancouver’s new “natural governing party.” All the more reason, in this blogger’s opinion, to honestly evaluate its strengths and weaknesses. Let’s start with the party’s “green” file. For the past six years, the Vision-dominated council has alienated many with an aggressive pursuit of cycling infrastructure, as part of its goal of making Vancouver the world’s greenest city by 2020. While we may quibble over this or that detail, this or that choice for where to locate a given bike lane, the need to encourage safe and convenient alternatives to car use is imperative from an environmental standpoint. Don’t be fooled by hyperbolic warnings of drivers and cyclists battling it out for supremacy on city roads. There may be some griping, but most people are willing to live and let live. To promote cycling during an era of climate change is simply common sense. Vision also deserves credit for being the party most forcefully in favour of a Broadway subway, making the mayor and his team, in concert with other municipalities (all of which are at least partly on board), well placed to negotiate with higher levels of government. As repeated ad nauseum over the campaign, the Broadway corridor is the busiest bus route in North America (defined as Canada and the United States). While a hypothetical light rail line might release some of this pressure and could certainly be built on the cheap, the subway option would almost certainly have greater carrying capacity. The goal is to move the maximum number of people in the least amount of time, not just in response to current needs, but in anticipation of future needs as well. Vancouver’s transit planners spend too much time playing catch-up. What we desperately need is to get out in front of the demographic trends. Finally, Vision is steadfastly opposed to such fossil fuel projects as coal export terminals and the proposed Kinder Morgan pipeline expansion. These matters, strictly speaking, are not subject to local jurisdiction. But given Vancouver’s geographic and economic placement, our civic government undoubtedly has influence, should it choose to exercise it. Environmentalists certainly appreciate having the province’s largest city on their side. Truly, Vision’s Achilles’ heel is Vancouver’s housing affordability crisis. By some measures, Metro Vancouver is the second least affordable housing market on the planet. Not all the blame for this unpleasant fact can be laid at the feet of the current mayor and council, but neither can it be said that rectifying the problem has been a major priority during Vision’s first two terms. Perhaps the most unconscionable symptom of this growing crisis is the recent spike in the city’s homeless population, flying in the face of Robertson’s 2011 pledge to eliminate street homelessness by 2015. One wonders, in light of these results, if the city’s efforts to evict tent city protesters from Oppenheimer Park last month amounted to little more than a PR-conscious move to sweep the problem under the proverbial rug. The condos and high-rises largely pursued under Vision’s watch rarely yield true affordability — or, for that matter, environmental sustainability. Towers are notoriously energy inefficient building forms, and sprawl is only exacerbated when Vancouverites, pushed out of their neighbourhoods in the face of skyrocketing costs of living, flock to the suburbs in search of greater affordability. Vision Vancouver seems to be doing a lot of things right and a lot of things wrong. A few of its more green-tinged candidates could probably use another kick at the electoral can, but the party as a whole does not deserve a majority. Conscientious voters would do well to fill out the rest of their ballots with some of the more progressive alternatives. Staking out a position to Vision’s left, the Coalition of Progressive Electors (COPE), from which Vision split off in 2005 after a painful bout of infighting, nearly fell apart once again over the last year. The resulting offshoots this time are new parties OneCity Vancouver and the Public Education Project. But as tempting as it may be to punish a party so recently beset by internal disarray — and as prone as Vancouver voters have always been to do just that — the primary focus during an election must be on the issues themselves, not on the headline-grabbing sideshows. And it is on the issues where COPE truly shines. Deriding both Vision and the NPA as “developer-funded parties,” COPE promises to create a Vancouver Housing Authority, to build and preserve publicly owned social housing, to establish rent controls, to put in place special taxes on vacant and luxury properties, to end renovictions, to impose a $15 per hour municipal minimum wage, to introduce a $30 per month universal transit pass for all Vancouver residents, and to make Vancouver a “Sanctuary City” for non-status migrants. Some of these policies would be difficult, if not impossible, for Vancouver to implement on its own, but they are laudable aspirations. COPE is right to push the limits of municipal jurisdiction as a means of elevating its negotiating position with higher levels of government. As a result of the party’s equity policy, a majority of COPE candidates are women, and First Nations representation is required on each of its three slates. Moreover, in the person of mayoral candidate Meena Wong, Vancouver voters now have a chance to elect their first female and Chinese Canadian mayor. Visible “minorities” make up roughly half the city’s population, as do women, yet both both groups are chronically underrepresented in government. For Wong to occupy the mayor’s chair would be a breath of fresh air in more ways than one. The Vancouver Greens, though showing signs of beginning to outgrow their “perpetual underdog” status, are not running a mayoral candidate. Instead, they choose to concentrate on their minority slates for council, parks, and schools, professing as a matter of principle that no one party should control a majority of seats. With at least one poll, however, suggesting they are within striking distance of supplanting the NPA as the second party on council, they may well choose to revisit this policy come next election. The Greens share more than a few platform points with COPE, especially on housing. They vow to work against renovictions, to protect existing low-cost housing, to adopt the standard definition of “affordability” as constituting no more than 30 per cent of gross income, and to consider introducing taxes on vacant and luxury properties. They also plan to strengthen the new Vancouver Affordable Housing Agency (which Vision appropriated in watered-down form from COPE), and they refuse to accept campaign donations from developers. On planning and density issues, the Greens push for increased community engagement, on both a neighbourhood and a citywide basis, in contrast to what they perceive as Vision Vancouver’s top-down approach. They seem to favour preserving neighbourhood character, encouraging wood-frame construction, modestly increasing the number of units allowed on single-family lots, and building low-rise developments on a more evenly distributed basis, rather than pockets of towers. They would fund public transit from revenue sources other than development levies, so as to diminish the incentive for excessive density. Like Vision, the Greens emphasize the importance of walking, cycling, and transit, but they consider Vision’s take on bike lanes a bit ad hoc, and advocate an end run to completing the city’s cycling network. They propose that Vancouver produce more of its own energy and food, while banning the use of GMOs. Incumbent Green councillor Adriane Carr seems to have widely impressed during her first term at city hall, and she is considered a shoo-in for re-election. It would be nice to see her bring back a couple of colleagues under the Green banner. The Vision-dominated Park Board and School Board both deserve praise for introducing broadly trans-inclusive policies during the last term. Also, the School Board is standing strong against the temptation of corporate funding from Chevron, which blights many other school districts in the region. It bears mentioning, however, that parks underwent significant budget cuts under Vision’s tenure. And while the decision by Vision commissioners to prohibit the breeding of dolphins and whales at the Vancouver Aquarium is a well-intentioned step in the right direction, an all-out ban on cetacean captivity would send a much clearer message. Further, let us not forget the shameful way in which the party pressured popular candidate Trish Kelly to step down in response to a jokey monologue she performed on masturbation eight years ago. While Vancouver’s at-large electoral system tends to produce wildly disproportionate results, it also offers voters the chance to mix it up by selecting candidates from across multiple parties. What follows are the selections of yours truly. Election day is November 15th. Advance voting is already underway here in Vancouver and continues through the 12th. All the information you need to take part can be found on the city’s website. In 2011, barely one-third of registered voters turned out. Surely we need to do better this time.